Two Palestinian teenage boys have lost their lives and more than a dozen protesters sustained injuries during clashes between Palestinian protesters and Israeli soldiers stationed on the border between the eastern Gaza Strip. The spokesman for the Gaza Ministry of Health, Ashraf al-Qidra, said in a statement that 14-year-old Hassan Iyad Shalabi was fatally shot in the chest during a 'Great March of Return' protest east of the city of Khan Yunis, located about 25 kilometers (15 miles) south of Gaza City, on Friday. He noted that 17 demonstrators suffered gunshot wounds, while dozens of Palestinians suffered excessive tear gas inhalation after Israeli forces sought to suppress the anti-occupation rallies. 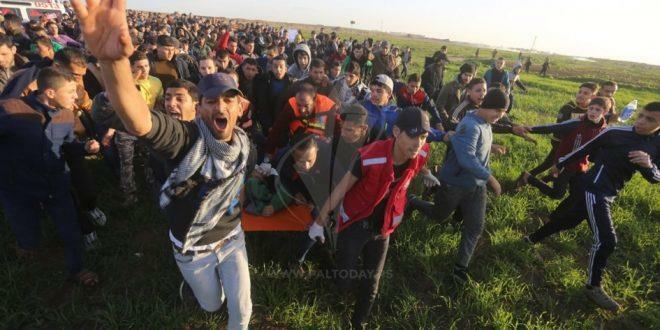 Israeli troops also fired live bullets and tear gas canisters at demonstrators taking part in a rally at al-Awdah refugee camp east of Rafah city, located 30 kilometers south of Gaza City. The forces targeted an ambulance with a tear gas canister as well. More than 250 Palestinians have been killed by Israeli forces ever since anti-occupation protest rallies began in the Gaza Strip on March 30. Over 26,000 Palestinians have also sustained injuries. The Gaza clashes reached their peak on May 14 last year, on the eve of the 70th anniversary of the Nakba Day (Day of Catastrophe), which coincided this year with the US embassy relocation from Tel Aviv to occupied East Jerusalem al-Quds. On June 13, 2018, the United Nations General Assembly adopted a resolution, sponsored by Turkey and Algeria, condemning the Israeli regime for the death of Palestinian civilians in the Gaza Strip.